Menjangan Island or Pulau Menjangan is a harmonious blend of beautiful deep blue sea, coastal, terrestrial habitat and spiritual value. The diversity of coral reef, reef fish and other marine life are very indulgent to snorkelers and divers. This place has a white sandy beach with warm and shallow waters, really suitable for soaking and swimming. On the beach, visitor can enjoying the natural panorama and the deep sea water under the sun light. This natural and uninhabited islands offers a tranquility and high spiritual values. It's truly amazing! Pulau Menjangan is situated just off the northwest coast of Bali. The trip to Pulau Menjangan can be done by boat from Labuhan Lalang which is located in the Distrik of Gerokgak, Buleleng Regency, Bali. Let's take a closer look to the amazing of Pulau Menjangan! Visitor can access this place directly from Ngurah Rai International Airport, about 145 Kilometers (4 hour 15 minutes) through route Antosari - Pupuan - Subuk - Seririt - Singaraja - Gilimanuk. From Singaraja City to the west through Jalan Singara-Gilimanuk for about 73 kilometers or 1 hour 40 minutes. 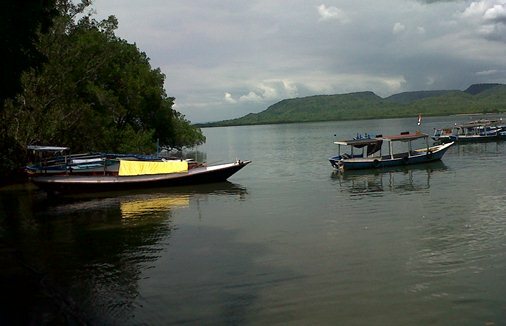 Labuhan Lalang can also be reached from Gilimanuk Harbour for about 16 Kilometers or 15 minutes. Located in northwest coast of Bali, the area is influenced by "Somewhat Dry Climate" (E type climate based on Schmidt-Ferguson climate classification maps). Somewhat Dry Climate here has humid season which begin from December continues until April. The soil in this area is derived from Prapatagung Formation which consist of limestone, calcareous sandstone and marl. Thi land is covered by savana forest vegetation. This place is suitable for many tourist activities such as snorkeling, diving, swimming, sightseeing and spiritual. The trenches at Menjangan Island Bali dive sites has a diversity of coral reef, reef-life and other marine creature very alluring to the visitors (snorkelers and divers). White sandy beaches combined with warm and shallow waters very ideal for swimming and also enjoying the exotic and natural deep blue sea. This beautiful island is surrounded by beautiful coral reefs gardens with a very diverse marine life. Island with warm and calm water, crystal-clear and illuminated by sunlight which penetrate to the sea bed brings out the beauty of colorful coral reefs. The diversity of marine life is very intriguing and so natural such as soft corals, sponges, coral crevice and greatest diversity of gorgonian. Therefore, Pulau Menjangan becomes favorite destination for snorkelers. Pulau Menjangan also has a stunning underwater scenery penetrated by sunlight is very alluring the divers. A trench with ravines wall dotted by coral reefs and marine life. Menjangan Island Bali dive sites is full of nooks and crannies, which are covered by soft corals and sponges and colaborate with marine life, gorgonians, coral fish and turtle. With warm water conditions, divers can dive and gaining clear visibility up to a depth of 50-60 meters. Pelagics are fairly rare on this location because this place is sheltered from the cold currents coming in from the open sea. Pulau Menjangan is the habitat of the Barking Deer (Muntiacus Muntjak). This beautiful place is included into West Bali National Park. Visitors can occasionally see the deer on the beach. In addition to menjangan, there are various types of seabirds and shorebirds. The Island have entered by government into the region of the National Park to do habitat protection of the Pulau Menjangan. Pulau Menjangan offers a spiritual attraction, places for worship and meditation. The spiritual activity is not only done by local people in Bali, but also from outside the island. There are 8 (eight) temples at Pulau Menjangan such as Pura Segara Giri Dharma Kencana, Pura Taman/Beji, Pesraman Agung Brahma Ireng/Ratu Patih Kebo Iwa, Pura Sang Hyang Siwa Pasupati, Pagoda Agung Dewi Kwam Im/Dewi Kemakmuran, Pendopo Ida Bhatara Dalem Gajah Mada/Hyang Wisnu Murti, Pelinggih Ida Bhatara Lingsir Watu Renggong dan Pelinggih Sang Hyang Ganesha. The location which only reachable by boat, quiet and uninhabited, offer the visitor with tranquility blue sea, and provides high spiritual and magical value. And also away from the hectic and crowded situation on the mainland of Bali. Amazing remote island and certainly worth a visit. Take your time to travel to Pulau Menjangan Bali, hopefully helpful and thank you!